When you visit a new town, it’s nice to be welcomed. When you meet new friends, it’s nice to get to know them. When you try a new tool? Well, you probably still want the same thing: someone to say hello to you, someone to tell you what’s up, someone to offer a hand if you need help. And there are many, many places on the web that do just this via fantastic onboarding emails. I spent 35 days with 13 of these awesome places, learning how they approach onboarding of a new user via email. I looked at several different industries: e-commerce, SaaS, entertainment, etc. Nearly everyone did something a bit unique and different. You can check out in-depth breakdowns of all 13 companies in the Aloha publication on Medium. Here, I’m eager to share with you the big-picture takeaways, trends, and tips that I observed from these superstar email campaigns. This is my number one, very favorite tip I learned from these great onboarding campaigns. And it’s so easy! 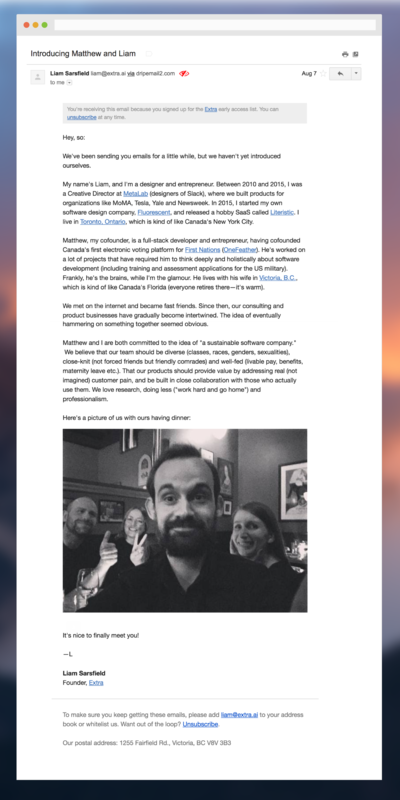 This email from Intercom has a sender avatar. This email from someone else, doesn’t. What a difference a face makes! When I hear about email personalization, I often hear about the good, old-fashioned “put someone’s first name in the email.” That’s definitely a nice touch, but personalization can mean so much more these days. The best kind of personalization I saw? Completely custom reports about your activity. There were a couple places that did this really well: Fullstory (above) and Grammarly. We try this at Buffer, and it’s been really effective. If you can find a way to do this for your customers, you’ll strike gold: easily replicable content you can send every week, sticky triggers to drive more app usage, and that warm, tingly feeling that customers get when they’re given something that’s all theirs. I received some reallllllly long emails. Like, Gmail couldn’t show them all. Like, I wish I could’ve Pocketed some. But you know what? The content in them was absolutely stellar! There was a good variety: some of the long ones were image-rich newsletters and others were plain-text notes. The ones that have stuck with me the most were the plain-text ones, written by a real person. The mix of plain-text and a real person’s name gave things a very personable touch. Liam’s emails especially stood out to me because they were so unique and human. Bonus points: He put a picture of himself in one. Word of warning: Many people’s authenticity radar is pretty well tuned. If you’re going to send a plain-text email from a real person, it’s probably best to have that real person write it. So many companies do this now! You’ve likely experienced how e-commerce companies do this: they send you an email when you’ve added something to your shopping cart but failed to finish your purchase. Now not every online business has shopping carts to fill (SaaS, for instance). But most online businesses do have a key element in their onboarding that they’d love to drive home: mobile app downloads, choosing a billing plan, installing a script, connecting a social profile. tl;dr — we can all have cart abandonment emails, even if we don’t have carts. Intercom spoke to me during those first two days. HubSpot spoke to me then (and not much else). Some cool tools like Mixmax take this even a step further: Yes, they email during the first two days, but they also keep emailing you every two days afterward (a 14-day, seven-email campaign in total). One of my few pet peeves in life is when people drive 30mph in a 35mph zone. Another pet peeve candidate is the no-reply@ email address. It was still quite common in the onboarding sequences I studied. Typically, the no-reply@ comes early in the sequence — a confirmation email or welcome email. Overall, this probably doesn’t hurt the experience too much, but it’s the principle of the thing! What if someone had a question at the confirmation step? What if someone just wanted to talk to you? Sidenote: My favorite email addresses of the study were from FullStory thefuture@fullstory.com and anyone with a hello@ email. About 1/3 of the onboarding campaigns I analyzed included at least one plain-text email. Several campaigns included nothing but plain-text emails. Of course, these aren’t actually plain-text emails. You have to include some image if you want to track email opens. They’re minimal HTML emails made to look plain-text. Still, the theory holds: Your best friend sends you plain-text emails. If a company does, too, then chances are you might think of that company as a friend? 9. What one job does your email do? Someone told me this once about email, and it has stuck with me ever since. Every email should have one job. And only one! So many of the great onboarding campaigns that I received took this advice to heart. 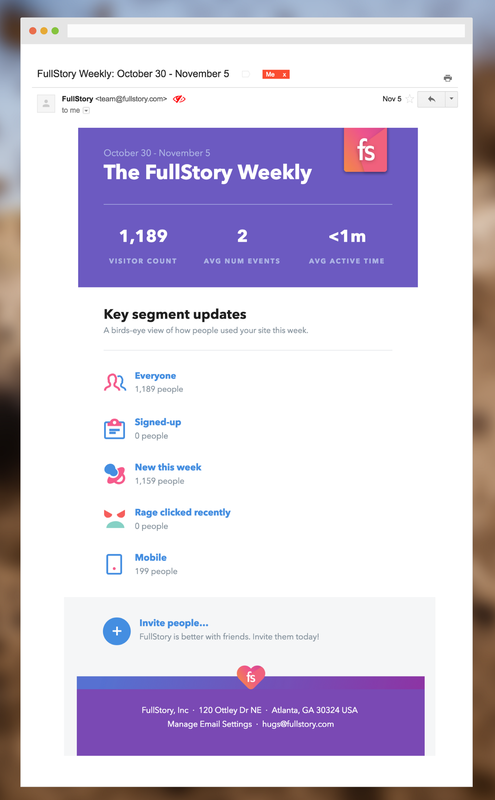 FullStory’s key onboarding sequence is just one email based on one event: did you or did you not install the snippet. 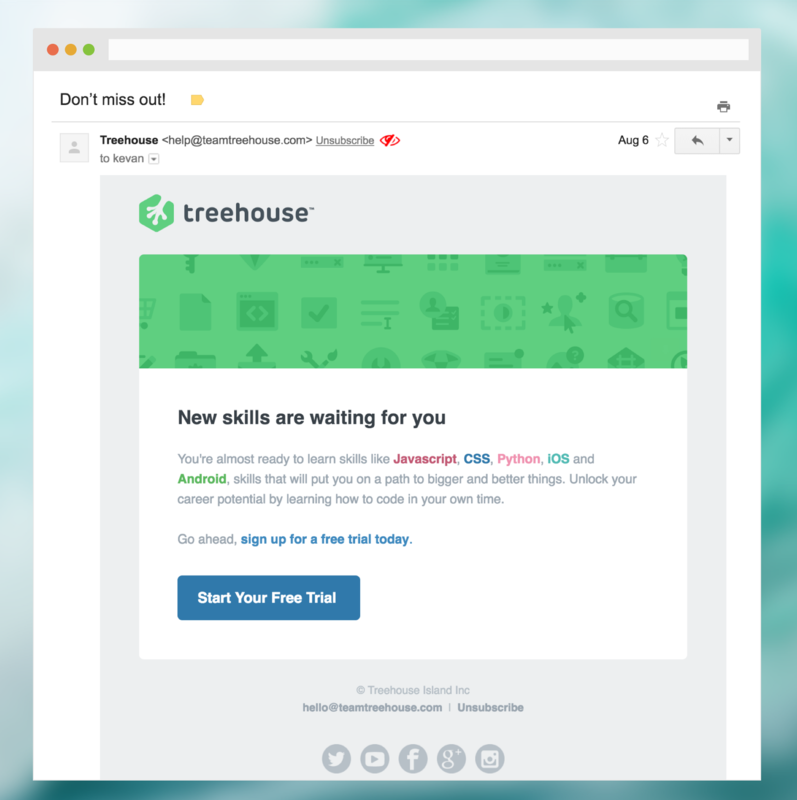 All of Trello’s emails just had one big, bold button. Talk about clarity! Every Wistia email links to a Wistia video. Rule of thumb: If you want to say a couple things in your email, then send a couple different emails. This one blew me away and then seemed so obvious: You can keep sending people email even if they don’t become users of your product. Intercom showed me this tactic. 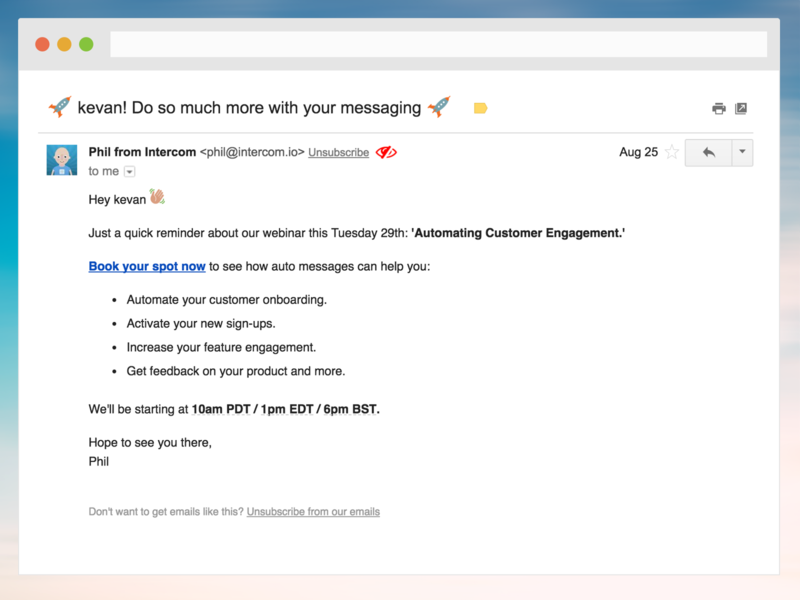 I received the standard onboarding campaign from them, I didn’t convert to a paying customer, and then I kept receiving so much email from Intercom. I was invited to webinars all the time. I was told about new product features I might be interested in. Intercom treated me like the product-qualified that I am, rather than a churned user who must not care about Intercom. It was fascinating. Since I never unsubscribed, they assumed there was still intent, perhaps buried deep within me but still present enough that Intercom would keep emailing until I said stop. I very nearly resubscribed. Had I not just been signing up for tools in order to study onboarding emails, I probably would have!